Vandalia-Butler’s Megan Allen protects the ball against Piqua’s Andrea Marrs Saturday. 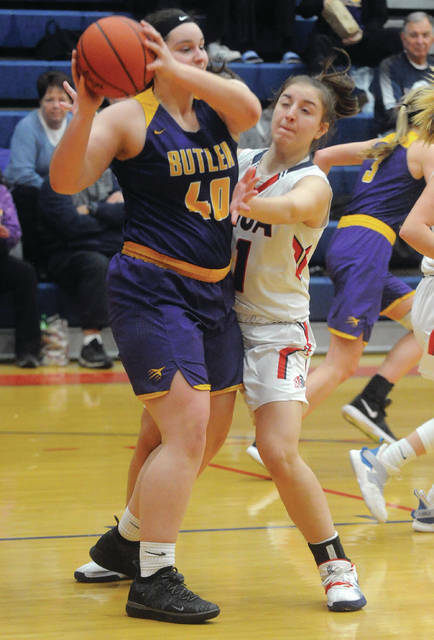 PIQUA — In a matchup of two of the teams battling for second-place in the GWOC North, Vandalia-Butler pulled away in the second quarter and maintained a double-digit lead the rest of the way for a 47-32 victory over Piqua Saturday at Garbry Gymnasium in GWOC American action. Piqua dropped to 11-5 overall and 7-4 in GWOC American play, while Vandalia-Butler improved to 9-8 overall and 7-4 in GWOC American play. It gave the Lady Aviators a sweep of the season series with Piqua. Both teams trail second-place Troy by one game. 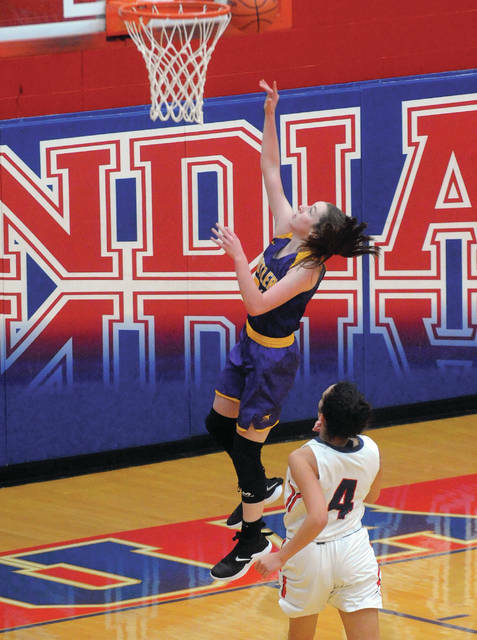 Vandalia-Butler used some clutch 3-point shooting and strong defense to overcome a “Yeomans” effort by Piqua. Tylah Yeomans, a 5-9 post — despite sitting out half of the second quarter and missing most of the fourth quarter — finished with 14 points, five rebounds, four blocked shots and five steals. Vandalia led 10-7 after one quarter and was leading 14-11 midway through the second quarter when Yeomans went out with her second foul. Vandalia responded by scoring the next 11 points. Gracie Price started the run with a 3-pointer. Tyree Fletcher scored inside, before Abbie Schoenherr and Jacie Dalton hit 3-pointers to make it 25-11. Only a desperation three by Karley Johns got Piqua within 25-14 at the break. The third quarter started with Piqua lobbing the ball inside to Yeomans first six points, with Kelsey Bachman pickind up two assists and Kenzi Anderson adding one. But, Vandalia answered at the other end each time to maintain the lead. Dalton and Price both hit two free throws each and Evan Neely scored inside. Evan Neely added another basket and Schoenheer hit a three to give Vandalia a 36-22 lead heading to the fourth quarter and Piqua could never get back to single digits. Kelsey Bachman and Karley Johns added six points each to the Piqua cause. Schoenherr led Vandalia with 16 points, while Evan Neely scored 10 points. Fletcher was a force inside with 11 rebounds, before suffering an injury late in the game. Dalton scored eight points and Price added seven. Piqua was 12 of 29 from the floor for 41 percent and five of eight from the line for 63 percent. Vandalia was 16 of 46 from the floor for 35 percent and 10 of 17 from the line for 59 percent. Piqua travels to Tippecanoe Wednesday, while Vandalia-Butler travels to Greenville the same night.